The Multicore Software Engineering, Performance, Applications, and Tools (MUSEPAT) technical track is part of the 31st ACM/SIGAPP Symposium on Applied Computing (SAC 2016) and will be held April 4-8, 2016 in Pisa, Italy. For the past thirty years, the ACM Symposium on Applied Computing has been a primary gathering forum for applied computer scientists, computer engineers, software engineers, and application developers from around the world. The SAC-MUSEPAT track addresses development challenges in multicore parallel systems. It brings together software engineering researchers, applied computer scientists, computer engineers and application developers. Multicore challenges covered at MUSEPAT include specification, design, programming models, programming techniques, testing, analysis, debugging and applications. The conference track addresses parallelism in a broad range of contexts: manycore CPUs and GPUs, clusters, distributed systems, mobile devices, client-servers and desktops. 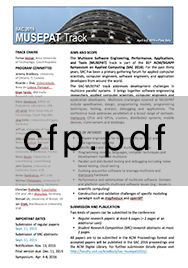 The official call for papers is availabe in pdf and plain text. The SAC Technical Track on Multicore Software Engineering, Performance, Applications and Tools has grown out of the successful series of IWMSE and PADTAD workshops, and merges these two communities into a single and broader forum.